So Scott has acquired a gadget. I’m sure from the photos coming up, you’ll figure out what that gadget is. He also has a birthday coming up in less than a week. Combine that with me and a sewing machine, and I knew what to make him for his big day. I studied a couple of other gadget case blog posts, namely the Padded iPad Sleeve Tutorial and the Slightly Self-Cleaning iPad Sleeve. I liked the padded sleeve because no closure was necessary, but I liked the soft idea of a self-cleaning sleeve. So I built a fleece-lined sleeve that I think hits both nails. I started by cutting, freehand, four rectangles of fabric. Two of the grey fleece (I thought about using black, but the only choices at the Wal*Mart fabric section were grey, maroon and navy blue) and two of the outer patterned fabric. I gave myself a good healthy inch on all sides of the gadget, so I’d have plenty of room to maneuver. I’d just trim the excess off later. 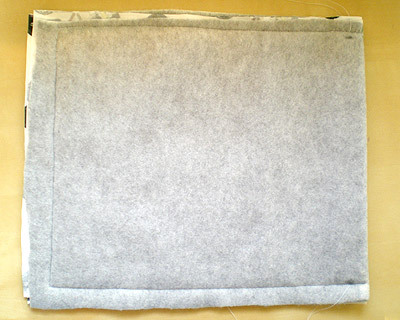 Next, I put one panel of fleece and one panel of pattern together, with the right sides together. I stitched across the top of each, so that they could then be flipped right-sides-out. This made a two-piece front and a two-piece back, pattern on the outside and fleece on the inside, with a nice neat lip. As you can see, I didn’t stitch all the way across the top; I knew I’d be cutting some of the sides away, so I stayed about an inch in from the left and right sides so as to not cut through any of my stitching. After flipping the panels, I made a gadget sandwich. The two double-fabric panels should have the right side of the pattern facing each other, and the right sides of the fleece on the outside. Line up the top of the gadget with the nice tidy sewn-and-folded edges, and pin it tightly on the sides and bottom. The key is, you’re not going to sew where the pins are; you’re going to sew a little bit outside the pins. Because when you flip this thing around right-side-out, there’s going to be a little bit of space taken up by the extra fabric just outside your stitches. If you pin this tightly, then sew outside the pins, it should give you enough room for that extra fabric while keeping the pad a snug fit. Sew outside the pin lines, all the way around the outside. As you can see (if you squint really hard), I started and ended my stitching about a quarter-inch below the lip; they won’t come undone, because I back-and-forth stitched a couple of times, and this way I won’t have any little bitty thread ends sticking out the top. Trim the edges. And on the bottom corners, trim diagonally. That way when you flip this thing right-side-out, you won’t have big waddy bulges of fabric down in the corners. I cut this fairly close; probably a little less than a quarter-inch. Flip the whole thing inside-out, poke a finger or the end of a pen down into the corners to square them out, and you’re done! 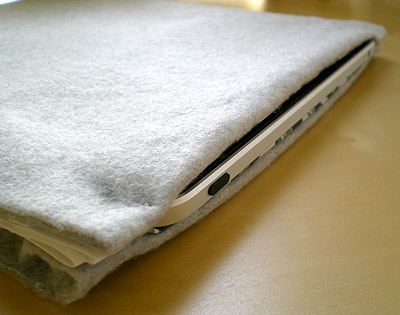 Your gadget of choice has a cozy, fleece-lined, happy little home. I also made a smaller one for my phone. 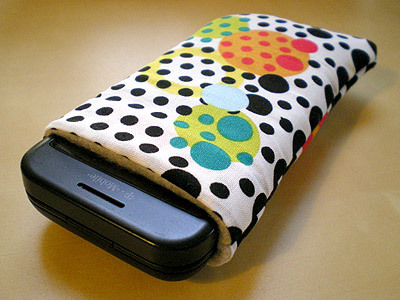 (Different fabric — for the phone, I used the same grey fleece and some cute material I got in a set of fat quarters.) Same steps as above, but on a smaller scale. And you’ll want to stitch outside the pin lines a bit further, because there’s not as much wiggle room in the smaller format. This case fits, but it might be a little too tight. And hey, you’re wondering — is Missy going to talk about the fabric she used for Scott’s case? Why yes, yes she is. Here’s the deal: I had it made at Fabric on Demand. They gently walk you through the whole process, from uploading an image or pattern, deciding how you want it displayed on the fabric, and what fabric weight and amount you want. I chose the 6 oz. cotton; it’s a little tougher than the 4 oz. (typical quilting and calico cotton is 4 ounce) and feels almost like a good cotton duck. I made one PNG file of the six-logo flower, and they laid it out in a half-brick repeating pattern for me. I ordered a “fat quarter” (18″ x 21″ rectangle), which was more than enough for this project and a matching phone case. The turnaround was amazing. I ordered April 28th, was sent a proof of how it’d look on the 29th, it shipped on May 5th, and it arrived today, May 7th. 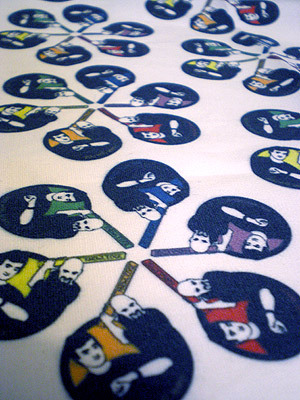 Less than a fortnight from having a crazy idea to having the fabric in my grubby little hands. I love the internets, and I love living in the future! And speaking of things I love: Happy Birthday, Scott Meyer! Are you kidding me with this? What a great idea AND a great gift for the new iPad. Please tell the lucky son of a gun i wish him a Happy Birthday! I think this review is very comprehensive, can let masses understand iPad better.Of cource, People can buy an ipad or not, just all are up to themselves. So far from ipad realeased, I have to admit ipad is an revolutionary, really amazing! Just see the booming 3-party sofware and apps developers along with it. Hey, it’s me! The Green Wife. 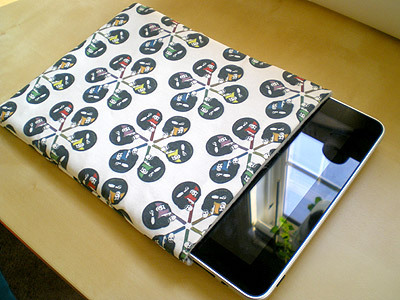 I love seeing what fabrics everyone chooses to use on their iPad sleeves. I’m glad it was a hit at your house! I used this just the other day to make myself a Batman sleeve. It worked great, I even got a bit creative and made a little pocket on the front. Thanks very much for the instructions!! This is the best tutorial I have seen so far! Thanks for sharing! This is the best tutorial I have seen! Thank you for sharing! I used your tutorial to make a kindle sleeve. Check it out! Thanks for the detailed explanation. Can’t wait to make one for my phone, too. I would really love to try to do this, what kind of fabric did you use??? The custom fabric on this was a 6 oz. 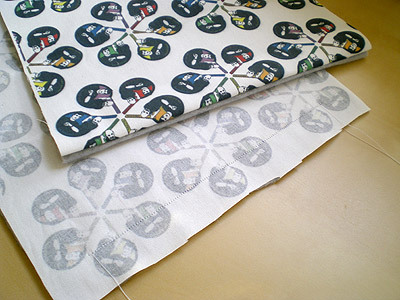 cotton — a little bit heavier than regular quilting fabric (though you could totally use that). 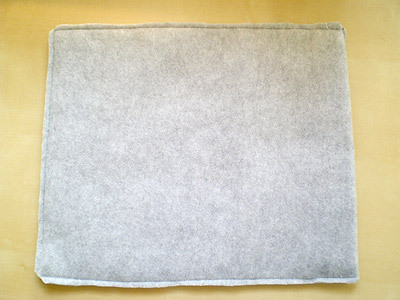 The inside was regular polar fleece. Thank you! I found this pattern quickly and it’s exactly what I wanted! I have been plotting an ipad case in my head but couldn’t wrap my brain around how to do it. This is so simple and will work great!